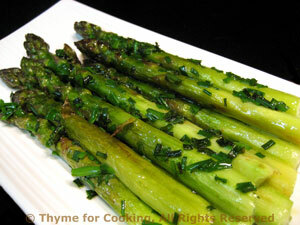 Sautéed Asparagus, Thyme for Cooking easy, spring side dish. Heat oil in a nonstick skillet just big enough to easily hold the asparagus without cutting. Add asparagus and sauté over medium heat until they start to brown and blister, 8 - 10 minutes. Sprinkle with salt and chives, roll around to coat, remove and serve.